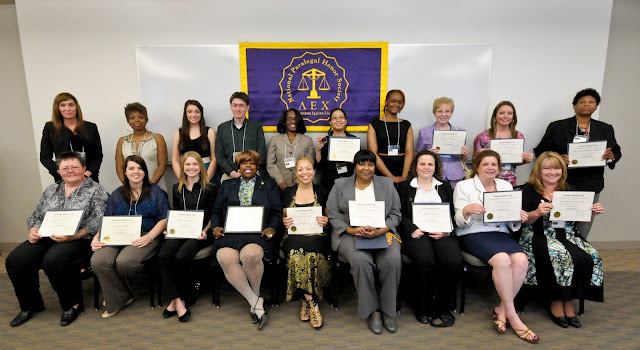 Congratulations to the newest members of Lambda Epsilon Chi (LEX), Peirce’s chapter of the National Paralegal Honor Society sponsored by the American Association for Paralegal Education (AAfPE). 20 new members were inducted at a ceremony held on Friday, April 20. These paralegal students join the inductees from last year’s inaugural induction ceremony. Pictured left to right, front row: Mary T. Husband, Tara Lee Wallace, Kelly Ann Schrader, Babette Pace, DeShayla Avant, Dorothy Y. Gatewood, Robin L. Roush, Lisa Lynne Zagler, and Ann Marie Jennifer Daly. Back row: Laura M. Schroeder, Karen E. Wheeler, Abigail Venezia, Alexander W. Sullivan, Andrea Providence, Diana N. Soukhaphonh, Marissa Williams, Patricia J. Weightman, Lauren Marie Cockley, and Sheila Marie Skinner-Martens. To be eligible for LEX membership, inductees must have a cumulative and major GPA of 3.5 or higher within the Paralegal Studies bachelor’s degree program, or the Post-Bachelor Certificate program. The honor society connects paralegal students to national scholarship, networking, and employment opportunities. To all of our LEX members -- keep up the great work! And finally, I’d like to recognize our terrific keynote speaker, Peirce alumna Babette Pace. You’re likely familiar with her name -- Babette is an active and successful member of the paralegal community here in Philadelphia, and she has remained well-connected to Peirce since graduating from our Paralegal Studies degree program. It was our pleasure to name Babette as an honorary inductee to our chapter at this year’s ceremony, a recognition of her many achievements and ongoing contributions to Peirce!